Can someone reassure me that this, whatever this is, will not kill me? Since I don’t have the patience to wait for any qualified advice, against my better judgment, which is already somewhat questionable, I just went on WebMD to check my symptoms, which are mainly: 1) unidentifiable weird bite/sting thing on my hand, 2) slight pain emanating from said bite/sting thing. The WebMD symptom checker questions alone scared the bejeezus out of me. One of said terrifying questions: “Have you been bitten, stung, or had contact with a poisonous spider, scorpion, or puss caterpillar?” First of all, how would I know if I’ve been stung by a poisonous spider, scorpion, or puss caterpillar? Isn’t that WebMD’s job, to tell me if I have been stung by a poisonous spider, scorpion, or puss caterpillar? And also, PUSS CATERPILLAR? 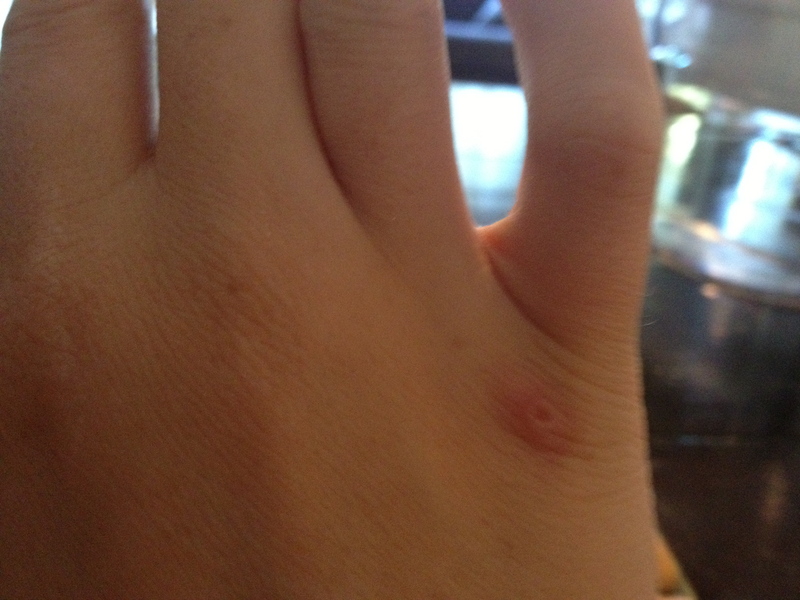 Another probing question: “Do you have a blister, painful sore, or purple discoloration at the site of a bite or sting?” Well, yes – I mean, this thing looks pretty blistery, and it hurts. So I clicked on the “yes” button, which brought me to another series of questions, one of which was: “Have you had a blister, painful sore, or purple discoloration at the site of a bite or sting for 24 hours, but you do not have any other symptoms of illness?” I think so? Has it been 24 hours? I don’t know! Probably? I clicked “yes.” I was shocked by the results. Wait, what now? “Wait to see if the symptoms improve?” Does. Not. Compute. Now that WebMD’s telling me I “may wait” to see how things develop, I don’t trust it. I don’t trust it one bit. I should make it clear here that I know better than to go on Web MD, but I just have no self control. I have a long history of diagnosing myself with diseases that I don’t have (various types of cancer, immune disorders, tropical diseases, and psychiatric illnesses, to name a few), under the terribly off base and alarmist guidance of WebMD. The problem is, I’m a bit of a hypochondriac. And I’m always open to suggestion. The worst part of my WebMD addiction is that on the rare occasions where I have actually been seriously ill, and WebMD should have been like, “Red alert, red alert, get thee to a healthcare provider,” it’s led me completely and totally astray. For example: remember that time I had typhoid fever? So, I was feeling horrible – sweating, shivering, no appetite, piercing headache, body aches, weakness, and joint pain. I felt like crap on a cracker, but I was pretty sure it wasn’t the flu, because, for one thing, I wasn’t coughing and, for another, the flu has never made me lose my appetite before (I’m a hearty one). So I went on WebMD to see what other terrible illness I could have been suffering from. I put in my symptoms and WebMD diagnosed me as suffering from – wait for it! – pregnancy. I re-entered my symptoms, omitting certain things each time, rephrasing, tweaking, and every time the results popped up: pregnant, pregnant, pregnant. When I dragged myself into my nurse practitioner’s office the next day, white as a ghost, sweaty, and barely able to hold myself upright, I croaked, “I’m concerned that I may be pregnant.” She looked at me like I was insane in the membrane and then said, “Yeah, pregnancy doesn’t look like this.” (Unless you’re having Rosemary’s Baby, I guess). I was relieved. Because if being pregnant feels like being deathly ill with typhoid fever, I ain’t never having kids. Anyway. I should know better than to trust WebMD but I’m addicted to it. Checking WebMD compulsively is in itself a sickness. I wonder if WebMD has that particular disorder in its catalog of horrors. I’m scared to find out. I don’t want to diagnose myself with anything else for today. This entry was posted in Life and tagged health, hypochondria, typhoid fever, WebMD on November 19, 2012 by Stephanie. I don’t know anything about the southern hemisphere but I am not too worried about it just from that picture. If you start getting lots of them I would worry about scabies/gnats/fleas/bedbugs but again I have no idea if you have those in South Africa. As for something poisonous, I think it would be a LOT BIGGER and you would have a LOT MORE SYMPTOMS if you were near dying. At least that is what I would guess.